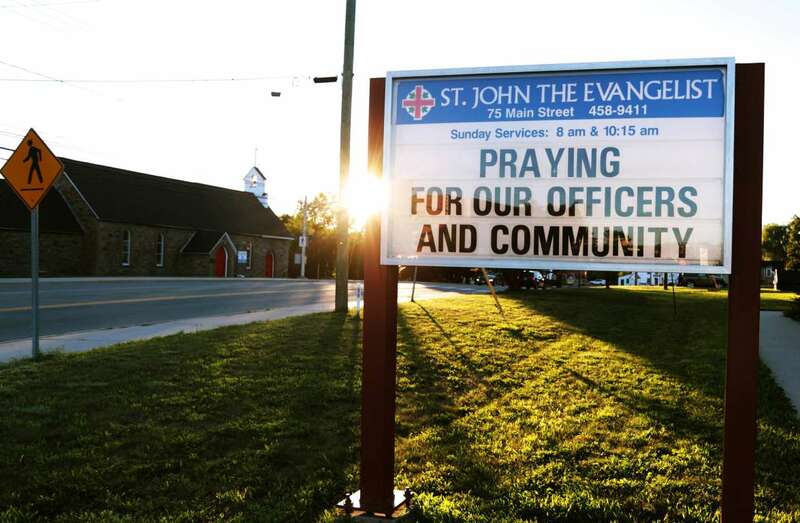 A message at the St. John the Evangelist Anglican Church notifies the community of a prayer vigil after a shooting incident in Fredericton, New Brunswick on August 10. Police charged a man in the deaths of four people, including two police officers, and identified the civilians killed in a shooting on Friday in the eastern Canadian city of Fredericton. Police charged Matthew Vincent Raymond, 48, with four counts of first degree murder, according to a statement on Saturday. They identified the civilian victims as Bobbie-Lee Wright, 32, and Donald Adam Robichaud, 42. Police did not release information about a possible motive or the weapon. The four people killed, including police officers Sara Mae Burns, 43, and Lawrence Robb Costello, 45, were shot at an apartment complex in Fredericton, capital of the province of New Brunswick. [post_ads]Police said the officers responded to a report of shots fired early on Friday morning and found two civilian victims on the ground. Sean Callahan said he grew up with one of the victims, his cousin Donald Robichaud, in rural New Brunswick. Robichaud, a musician and father of three, had recently begun a new relationship with Wright, Callahan said. "Donnie’s probably the best person you could ever meet in your whole life. The kindest person,” Callahan said by telephone from Fredericton. “Who in the hell would want to shoot Donnie Robichaud?" According to their Facebook pages, a Fredericton man named Donnie Robichaud was in a relationship with Bobbie-Lee Wright. The dead police officers were Burns, who had served two years on the force and another two as an auxiliary officer, and who had three children; and Costello, a 20-year veteran who left behind four children. Friday's shooting was the latest eruption of gun violence across the country. Gun laws in Canada are stricter than in the United States, but a proliferation of weapons has led to an increase in gun-related crimes in recent years. The shooting occurred three weeks after a gunman walked down a busy Toronto street, killing two people and wounding 13 before killing himself.